Working on “My Father’s House” has been a life changing eye-opener for me. As his youngest child, I had no real sense of the time when my father arrived in America in 1910 to the quiet little village of Forestville, Connecticut. My big sister and brother experienced much more of the earlier years. And of the amazing changes that occurred during his lifetime. My brother remembered the days when church services at Bethesda Lutheran Church were conducted in Swedish. In fact, he spoke Swedish with no apparent effort. I, on the other hand, begged my father to teach me Swedish. He didn’t, citing the prejudice he had experienced when he first arrived. I suspect it was really so he and my mother could talk behind my back while I was present. I have come to realize how painful it must have been for my parents when all three of their offspring married outside the church. Some things make real empathetic sense when one works at getting inside the life of another. And oh yes, I really miss my brother, partly because I miss him, and partly he isn’t here to answer the questions my sister is too young to answer. So now to Bill Bryson’s “One Summer: 1927.” I’m not really going to write a review. 2164 people have already done that on amazon.com. I will say it’s a great read and I strongly recommend it. But I want to talk about the reason why I read it – to understand the times my parents lived through. And even some of the times I lived through with them, which has me reading David Halberstam’s “The Fifties” at the same time. I loved Bryson’s book. His writing style is delightful. What got to me is realizing the amazing changes that took place in America and, indeed, the world, almost without people knowing it. Oh yes, people were excited about specific events. I must say, poor Lindbergh had my sympathetic understanding of the misery his Scandinavian shyness created for him as he became such a lauded hero. Some of the stories of how he – and his mother – handled it are really funny. I don’t think you have to be a Scandinavian to appreciate it. But the thing that got me is how many of our current problems are rooted in the events of those days. Adding to that Halberstam’s events of the 50s – when I thought I was a grownup – just highlights how much things are changing right now right before our eyes, or maybe secretly behind our backs. Aside from learning more about my parents’ lives, I find myself hoping to live another 30 years (yeah! Not likely!) to understand what’s going on now. “Who or what are we without our memories?” she asks. Of course Sheila knows she’s asking a very powerful question. The simple answer to it is, “We are nothing without our memories.” But what about Job’s wife? How did her memories sustain her through the terrible trials and the establishment of a new family after the appearance of the voice in the whirlwind. I’d love to hear how others would answer it after reading the book, but I can’t, of course, avoid making some of my own comments about memories. First of all, memories are not file folders that store simple data. Every memory is, instead, it’s own creation, based on things that were perceived creatively in the first place. Not only is it a creation, it will be edited anew each time we look back on it. So, “Who are we without our memories?” People incapable of taking our experiences and molding them to fit our view of who we are in the moment. So what would Dara have called on from the happy, the good, the confusing, the hurtful, the painful experiences she had developed in her life up to the point of the trials? How would she have constructed them to see her through that terrible time? How would she, in the second phase of her life, have fashioned her memories to make her the person she needed to be to live happily, productively, and lovingly in the years of her second family? How would she have used her memories to honor and love the memory of the lost children of her first family? How would she have used her memories to reconcile with Job’s “friends” who caused him such anguish? How would she have used her memories to reconcile with her God? How would she have constructed them to live with whatever guilt she may have had for her doubt and anger? Or might she have done with her memories what we all are capable of doing, especially when we have suffered extreme pain, or experiences that make no sense. Would she have simply pushed them back into the non-conscious recesses of her mind? That’s something we all do in large or small part to stay above the pain they cost. It’s a way of sparing us to get on with our lives rather than yielding to immobility. I’ll try next time to write and share a review of “Atonement“, by Ian McEwen,” the story of the terrible results of an adolescent girl’s false accusations and her subsequent efforts to rid herself of the pain of guilt – quite real by all standards, yet also understandable/explainable. Thank you dear Sheila for inspiring this answer. I want to get back into blogging, but having been away so long, I don’t know what to pull out of the “to do” pile first. Part of the problem is my limited energy. I guess it will take me a good year to completely recover from the event of April 15, and by that time I’ll be a year older, so it will come out even. Maybe you can help me sort things out. I know taking care of recovery comes first, and that seems to require a rather lengthy nap every afternoon, no matter how well I sleep at night. And that limits the times when I can see clients, or drive without fear of falling asleep again, and certainly interferes with writing time, especially since sitting at my computer tends to hurt my back. (So now I join the rather large crowd of people who manage daily to keep productive with some pain.) It requires more planning – or maybe less planning, for activities during my day. What I mean is, I can’t set up the kind of “keep on going all day” schedules that used to make it possible to get so much done. So, here are my choices that need prioritizing. 1. I need to look up the details on “Silver Sneakers” to increase my exercise beyond the workout I was taught to do every morning at home, plus a quick walk around the circle each day. Before the “event,” I used to do that in 11 minutes. (Yes, I hate exercise.) When I first got back to it I was doing it in 14 minutes. Yesterday I think I got it back down to 11. A big part of that walk, in fact, whenever I’m upright, is to focus on good posture. When one’s back hurts, it’s such a temptation to bend over. 2. I want to pick up where I left off on writing discussion questions to try to kick start currently non-existent sales of “Figs & Pomegranates & Special Cheeses.” I remember once reading the response of a best-selling author to the question, “What does it take to be a best seller.” His answer, “Be a best seller.” Obviously I’m not good at that, but I’m quite sure more time would help. The help of a friend in working up the questions keeps me thinking too. I just need to get the thoughts entered into my computer. 3. On that same note, I’ve got to get more involved with my web site. If I don’t do something more active with it, no one will ever find it interesting, or even find it. 4. I’ve read a few books while lying on my back since “the event.” Now I want to write reviews for amazon. 5. I had a fabulous two-week cruise shortly after I was allowed to remove my brace. The Shetland Islands, Iceland, and Norway were perfect for rehab. The trip over on the plane hurt. The trip home was a piece of cake. Time and walking helped a lot. I do have a few – not many – photos that might be interesting to share. One is a brief movie photo, because my new camera can do that. I call it the entrance to hell. 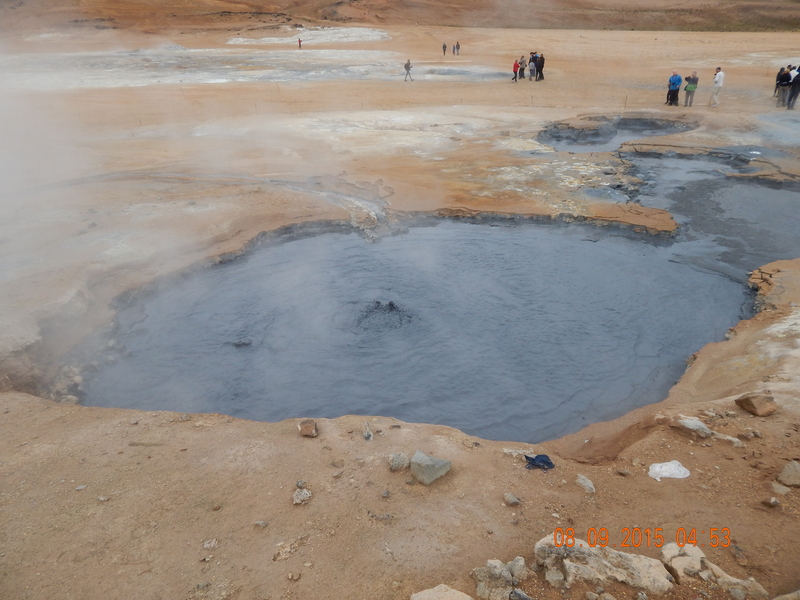 The geothermal experience in Iceland was fascinating. The photo to which I refer is of a roiling, boiling hot, green pond smelling of hydrogen sulfide gas. (rotten eggs.) Unfortunately I can’t figure out how to include it as a moving picture. I’ll try a still photo and hope you can enhance it with your imagination. I’m also including a photo of me to show the layers of clothes necessary in the chilly, rather wet weather we encountered. They told us it was an unusually cold summer. But it didn’t spoil the fun. 6. Speaking of re-hab, folks have asked me to write about my “crash” experience, and I want to do that. So many people were so helpful – delightful, even. And I can’t say enough about how helpful Medicare was. 7. I did manage to write a 5-page story to add to a local anthology. Actually – a rewrite of one I had on hand. 8. So many friends have offered to visit, or to meet me for coffee or lunch. I want to do that, but I’m hesitant to schedule a date,’cause some days aren’t as good as others in terms of energy. 9. One thing I did get back to in the past couple of days is writing “My Father’s House.” I’m doing the section on when he first arrives in America – specifically Forestville, Connecticut. 10. And I am seeing a limited number of clients. 11. Oh, I don’t want to forget the issue of clothes. The disc fracture cost me two inches of height, all in the torso, so my body is not only shorter, but shaped differently as well. Some clothes just need shortening, but beyond that I need a new wardrobe. Actually, that should be fun. My daughter is in town to stage manage a play, but we’re hoping to have time for a shopping trip. Am I blest or what that I can look forward to that? 12. So what else is new? I hope something more interesting for future blog entries.